Vijender Singh, who will compete in his first pro boxing bout on October 10, will take on three-fight old Briton Sonny Whiting. Vijender's opponent has a 2-1 win-loss record so far. India's first Olympic and World Championships-medallist will take the ring in his first pro contest against an opponent who is three-bouts old and has a 2-1 overall record so far in the middleweight division. Vijender said he knows it won't be easy against Whiting. "I know that my opponent Sonny Whiting will not be an easy first fight. He has already had three fights so he'll be prepared and I hear that he wants to defeat me in my first pro fight. He won't beat me, I'm so focused and determined on what I have to do," he said. Whiting, who trains under former pro boxer Johnny Greaves, said he is confident of upstaging the celebrated Indian. "I don't care who is in front of me on the night, they're going to get beaten, plain and simple. I hear that Singh is a massive superstar in India, well I'll be looking to send a brutal message back to his home when I beat him," Whiting said. "He's entering the world of the professionals now and it's going to be hard for him, he might of done plenty in the amateurs but that will count for nothing now. I'll make sure I give him a good welcome," added the 27-year-old, who has one knockout win to his credit so far. The 29-year-old Vijender has based himself in Manchester to train for this fight under renowned coach Lee Beard and has been training alongside Jack Catterall, Adrian Gonzalez and Jimmy Kelly. Despite being India's most successful amateur boxer, Vijender said he knows that he has to start from the scratch in the pro circuit. "It is getting very close now to my professional debut now and I can't wait for it. I have trained very hard and diligently for this fight in Manchester with Lee Beard who has been important in refining my style from the amateur way of fighting into the professional sport which is totally different," Vijender said. 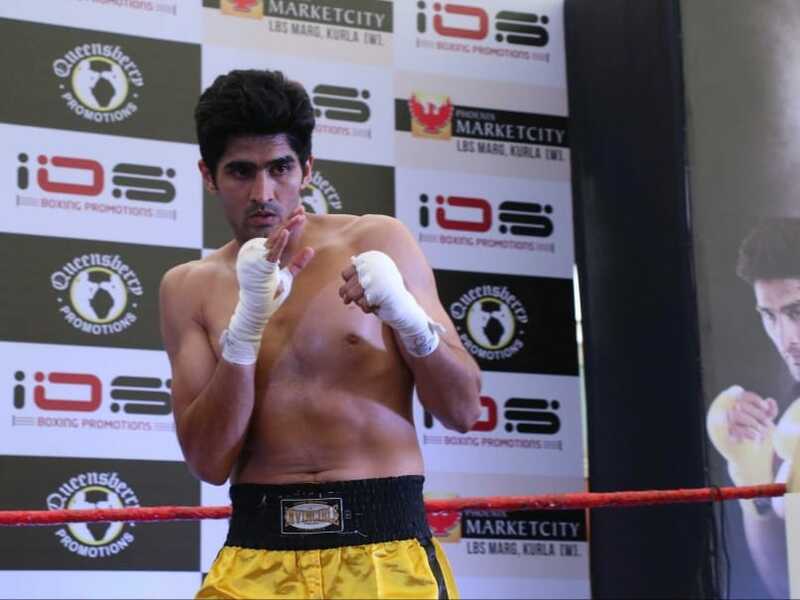 Vijender said he has made requisite changes to his game to be fully ready for the pro circuit. "It is like I'm starting my boxing career all over again. Even though I accomplished so much as an amateur boxer, to begin my professional career I've had to start all over again with my training to prepare for my pro debut and it has been a very exciting time," he said. "There has been a lot of changes and a lot of things we have been working on like the technical aspect of boxing, changing my diet and training schedule, the physical and mental preparation, it has all been important and I believe that I'm ready to fight." Vijender's bout will will be part of a double world title card headlined by Terry Flanagan's defence of his WBO Lightweight title against Diego Magdaleno and Liam Smith facing John Thompson for the WBO Super-Welterweight Championship.